In this lesson, we will learn how to identify and write simple inequalities to represent verbal expressions. Sameh walked for 29 minutes before reaching the university campus. He took at least another 5 minutes to reach the lecture hall. 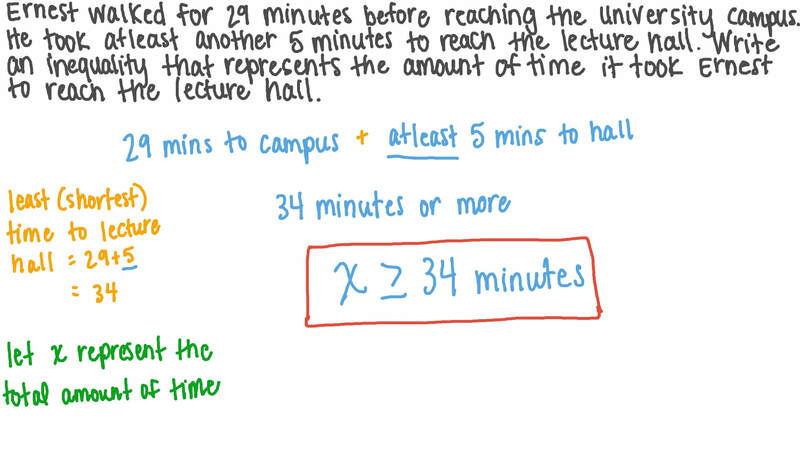 Write an inequality that represents the amount of time it took Sameh to reach the lecture hall. Samar was able to clean more than 3 7 of her flat after her friends came over and left. Write an inequality to represent the fraction of the flat that she still has left to clean. Write an expression for 𝑐 which means that it is less than or equal to 3. Write an inequality which describes the following sentence: The subscription fee is no more than $74. Write an inequality which describes the following sentence: Karim drives more than 7 400 miles per year. An Olympic athlete is helping her niece train. The athlete can run short distances at 9 m/s, and her niece can run short distances at 7 m/s. The athlete gives her niece a 2-second head start in a sprint race, and her niece runs for 𝑡 seconds. Write an inequality for the values of 𝑡 , when the athlete is behind her niece. Assume that they run at steady speeds the entire race. The number of cupcakes a café sells each day is 𝑐 . To make a profit, the café must sell more than 100 cupcakes every day. Write an inequality that describes when the café starts to make a profit. A school trip will run if at least 40 students want to go. Write an inequality to represent the situation, using 𝑆 to represent the number of students. The sign shown is on the railings at 𝑎 toddlers’ play area. Letting 𝑎 be the allowed age of a child in the play area, write an inequality that represents the rule on the sign. A corner shop has the sign “No more than 4 school children in the shop at any time.” Write an inequality that represents the statement on the shop’s sign, using 𝑛 to represent the number of school children in the shop. Which of the following is an inequality? Rewrite the statement “ 𝑦 is between 8 1 0 a n d ” using < , ≤ , > , or ≥ . Which of the following expressions ensures that 𝑥 is negative for all the possible values of 𝑥 ∈ ℝ ? Sarah needs to travel by train, and she’s preparing her journey to the train station. It takes her 7 minutes to walk to the bus stop from home. There is a bus every 12 minutes, and the bus journey to the train station usually lasts 20 minutes. After that, she needs at most 4 minutes to get off the bus and reach her train. Assuming her bus is not delayed, write an inequality to describe the time, , in minutes, it takes her to travel to the train station by bus. Given that her train departs at 14.47, at what time should she leave home to make sure that she catches the train? Write an expression for 𝑦 which means that it is greater than or equal to 4. Write an expression for 𝑛 which means that it is less than 3. Write an expression for 𝑏 which means that it is greater than 5. Write an expression for 𝑛 which means that it is greater than 5. Write an expression for 𝑏 which means that it is less than 1. Write an expression for 𝑎 which means that it is greater than or equal to 9. Write an expression for 𝑦 which means that it is less than or equal to 3. Write an expression for 𝑥 which means that it is greater than 5.